WASHINGTON — The Saudi government has released Sheikh Mohammed Hussein al-Amoudi, an Ethiopian-born billionaire who was arrested in November 2017, in an anti-corruption sweep.Ethiopia’s Office of the Prime Minister confirmed the news. Ethiopian-born Saudi businessman Sheikh Mohammed Hussein al-Amoudi is seen in an undated photo tweeted by the Office of the Ethiopian Prime Minister (@PMEthiopia). Reports of al-Amoudi’s possible release first emerged in May, when newly appointed Ethiopian Prime Minister Abiy Ahmed met with bin Salman in Riyadh to discuss mutual interests, including development partnerships and Ethiopian citizens detained in the Kingdom. In March, The New York Times reported that Saudi officials had released many detainees in the months after the sweep, including al-Amoudi’s cousin, property developer Mohammed Aboud al-Amoudi. 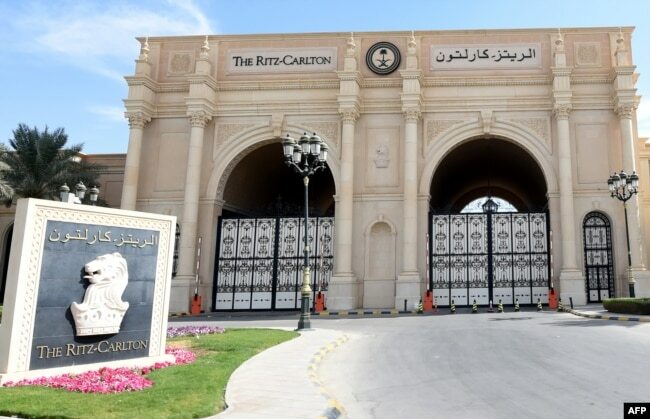 FILE – General view of the closed main gate of The Ritz-Carlton hotel in Riyadh, Saudi Arabia, Nov. 5, 2017. Dozens of elite detainees reportedly were initially being held in a well-guarded ballroom of the hotel as part of a sweeping corruption probe. Al-Amoudi’s whereabouts were unknown after he was moved from The Ritz-Carlton, Riyadh, where many of the arrested officials were first detained in a round-up that drew international headlines, and false rumors of his death began to circulate. In an email to VOA shortly after the arrest, Tim Pendry, al-Amoudi’s London-based spokesman, downplayed any impact on al-Amoudi’s business interests. Born in 1946 to an Ethiopian mother in the north-central part of the country, al-Amoudi immigrated to Saudi Arabia, his father’s country of birth, in the mid-1960s, when he began building his international business empire. By the 1980s, he had become a billionaire, and today his interests span from Europe and the Middle East back to Ethiopia, where his mining company, Derba MIDROC, has been accused of exploiting local communities in the Oromia region, the hotbed of protests that led to former Prime Minister Hailemariam Desalegn’s sudden resignation in early 2018 and the ascension of Abiy. Shortly after al-Amoudi’s arrest, Henok Gabisa, a professor of practice at Washington and Lee University School of Law in Lexington, Virginia, told VOAthat most of the billionaire’s wealth came from the Lega Dembi gold mine, in the heart of the Oromia region. In May, Ethiopian authorities suspended Derba MIDROC’s license after intense protests. Months later, in September, the government revoked MIDROC’s land lease. As a Saudi citizen, the legality of al-Amoudi’s ownership of extractive businesses in Ethiopia is murky. Ethiopian law restricts how foreign citizens can invest in the country. But with both roots, and decades of involvement, in the country, al-Amoudi may have operated within a loophole. Now, despite his freedom, al-Amoudi’s future is unclear. The political landscape in Ethiopia has shifted significantly since his arrest, and both the charges against him, and the impact of his detainment on his wealth and businesses, remain obscure.